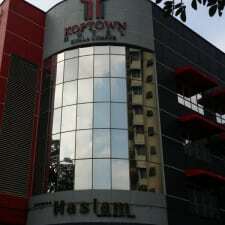 Located in Kampung Kerinchi, Koptown Kuala Lumpur places guests near shopping at the Mid Valley Mega Mall and Bangsar Village. The hotel offers amenities such as a business centre and meeting space. This hotel has 60 rooms, each one offering a private bathroom and air-conditioning as well as a TV, coffee maker and phone. Wi-Fi Internet access and bottled water are complimentary. Hairdryers are available on request. Facilities at Koptown Kuala Lumpur include concierge services, a 24-hour front desk, luggage storage and a safe-deposit box. No parking is available and pets are not permitted. Dining options within a short drive of the hotel include the Ganga Cafe, Fresca Mexican Kitchen & Bar and Long John Silver’s. This hotel is a 15-minute drive from Thean Hou Temple, 25 minutes from Kuala Lumpur city centre and 50 minutes from Kuala Lumpur International Airport. The general consensus from previous guests at this hotel is that you can expect to find the rooms here are on the small side but pleasing nonetheless due to the levels of cleanliness and comfort. Although the hotel is some distance from the city centre, guests have been pleased with the range of shopping destinations in the surrounding area. Guests have found the rates here reasonable when taking into account the overall standards of offer. It seems that this property offers a budget-friendly option without making guests compromise too much on quality. There’s no breakfast service at the hotel so guests have had to look elsewhere. Many note that there is nowhere nearby where you can eat a morning meal. There are restaurants, of course, but most of these are in the big shopping centres. Guests have complained about the level of unwanted noise here, mentioning noise from inside the hotel as well as external traffic noise. A number of guests have concluded that the lack of leisure amenities at this hotel coupled with its out of town location means that the property is better suited to a business stay.